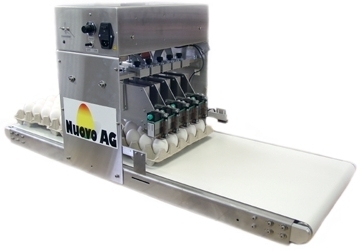 Egg stamp equipment for stamping of eggs with a fixed print text, such as producer number and / or logos, in which no continuous date is required. nen sind bei allen Geräten Standard. Alle Geräte sind mit 32 Drucktexten ausgerüstet, welche durch den Anwender über einen PC/Laptop verändert werden können. 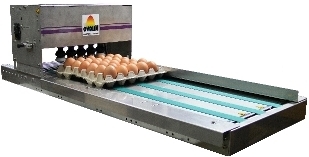 Egg marking devices to label on trays for 30 eggs, various kinds of small packages, as well as on the weighing or supply track of all common sorters and packers farm. The Nuovo Company has a high target concerning all economical and ecological activities. Especially our consumption of energy should have a share in protecting the environment. We are not using any electricity which is produced in atomic or thermal power stations. Since the foundation of Nuovo AG, all of the business facilities are heated through our own woodchip plant. We do not use any kind of energy made through fossil fuels. The whole development as well as the production of Nuovo is only based on ecological and CO2 neutral energy sources. We hope to have satisfied you with our lived and environmentally friendly conventions. To protect the climate has an increasing priority for us.